Spread Awareness of Heart Disease by proudly displaying your red ribbon. Heart Disease is the number one killer for both men and women and should be made known each day. Educate those around you of heart disease and the affect it can have on anyone when you show awareness with this Personalized Heart Disease Key Chain. 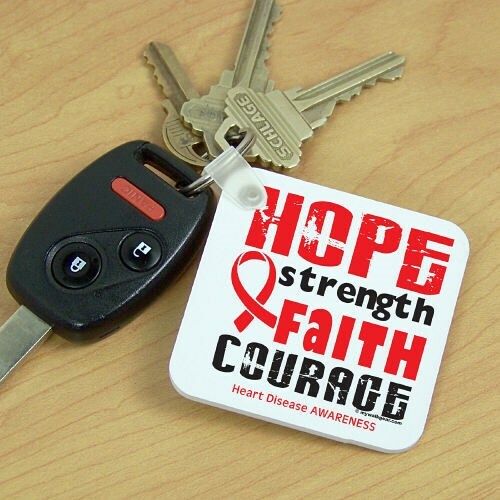 Our Heart Disease Awareness Key Chain is perfect for spreading awareness. Our Key Chain measures 2¼" x 2¼" and is a ¼" thick. Each Key Chain is made of plastic and includes a key ring. Additional Info At MyWalkGear.com, we are dedicated to promoting awareness of Heart Disease and encourage others to get involved in the fight for a cure with our Heart Disease Awareness Walk Shirts and Gear. Help us help those who need us the most with our inspiring Awareness Keychain along with our Heart Disease Hope Long Sleeve Shirt and our Heart Disease Hope Sweatshirt. Feel great knowing a portion of your purchase will be donated to end heart disease once and for all.